1. MULTI-FUNCTION:Multimedia function with AV VGA USB SD HDMI TV input to getting your favourite programs with a big screen. Enjoy video movies by connecting the PC / Laptop/Phone/, enjoy games by connecting PS3 PS4 or X-Box360 via HDMI port. 2.HIGH RESOLUTION：1200 LM brightness, 800x480 pixels native resolution, compatible resolution up to 1080p, contrast 1000:1. NOT Recommended for PPT, Word, Excel or business presentation. 3.SCREEN SIZE: 37-130 inches, Projection distance: from 1.2 to 3.8 meters, focus the image by adjusting the gear on the projector, another gear is for adjusting the keystone, suggest best projection size 50-100 inches, best projection distance 1.5-3m. 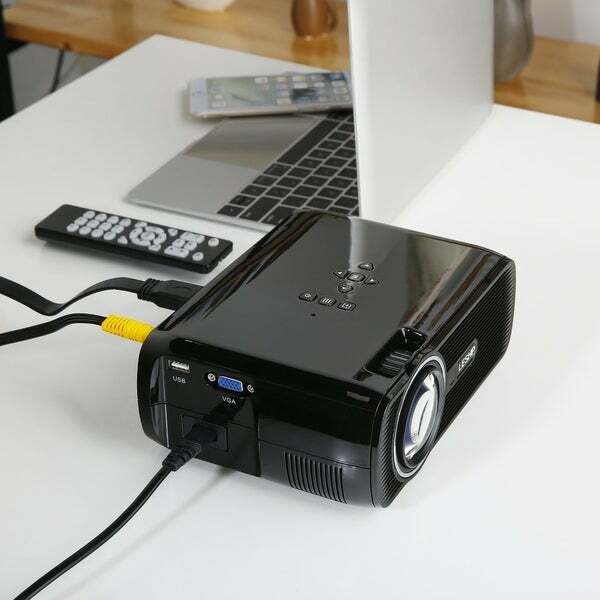 4.TECHNOLOGY:Built in 3.5mm audio port to connect additional sound system, newest mode and system, provide solid clear image in dark enviroment, suggest the projector had a break after working 4-5 hours avoiding overheating, treating it good, will extend its working life. 5.Latest LED Light Technology, about 20% more brightness than ordinary LED. 6.Using wireless HDMI adapter(not included in the package), deliver the screen of your smartphone (support MHL function) to a Bigger Screen, ideal and convenient for home cinema. *1. To connect the projector with for iPad or smartphone, you will need a wireless HDMI adapter. *2. To connect the projector with PC/Laptop, please adjust the PC/laptop display resolution to 800*600 or 1024*768, which can provide the best clarity. And choose the＂Multiple display＂as＂Duplicate these displays. Projection technology: TFT LCD panel display. Lamp Life:up to 20,000 Hours.